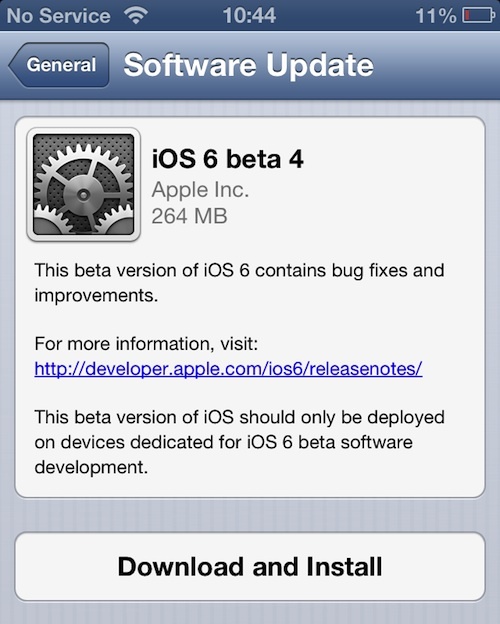 Apple has seeded the fourth beta of its new iOS 6 software to developers this morning. The release comes just three weeks after the previous update. 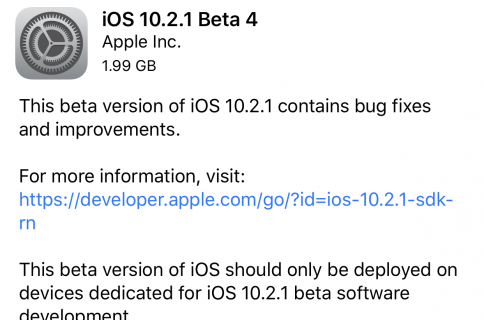 As usual, the new beta is currently only available as an over-the-air update, but the full version should come up on the iOS developer center soon. When requesting access to Facebook accounts, the only key required in your options dictionary is ACFacebookAppIdKey. ACFacebookPermissionGroupKey andACFacebookAppVersionKey are now obsolete.If you request a write permission under ACFacebookPermissionsKey, such as publish_stream, you must provide a value for ACFacebookAudienceKey, which can be one ofACFacebookAudienceEveryone, ACFacebookAudienceFriends, or ACFacebookAudienceOnlyMe. Users are able to grant or deny access to contact data on a per-app basis. To request access to contact data, call the ABAddressBookRequestAccessWithCompletionfunction after calling the ABAddressBookCreateWithOptions function. The ABAddressBookRequestAccessWithCompletion function does not block the app while the user is being asked to grant or deny access. Until access has been granted, the ABAddressBookRef object will not contain any contacts, and any attempt to modify contacts fails with a kABOperationNotPermittedByUserError error. The user is prompted only the first time access is requested; any subsequent calls toABAddressBookCreateWithOptions will use the existing permissions. The completion handler is called on an arbitrary queue. If the ABAddressBookRef object is used throughout the app, then all usage must be dispatched to the same queue to use ABAddressBookRef in a thread-safe manner. Authorization Status Not Determined—The user has not yet made a choice regarding whether this app can access the data class. Authorization Status Restricted—This app is not authorized to access the data class. The user cannot change this app’s status, possibly due to active restrictions such as parental controls being in place. Authorization Status Denied—The user explicitly denied access to the data class for this app. Authorization Status Authorized—This app is authorized to access the data class. FIXED: There is a known issue with dictionaries when attempting to define a word in any language other than English or Japanese. When the reference library is presented, the user is given the option to download a dictionary—that download may not begin. The user can tap outside the popover on an iPad or tap the Done button on the iPhone or iPod touch to dismiss the download request. icloud.com email cannot be sent from www.icloud.com. Users should use http://beta.icloud.com at this time if they wish to use a web browser to send email from theiricloud.com address. The behavior of coordinated read operations on iCloud Documents has changed:On previous iOS releases, when your app performed a coordinated read operation on a file or package and the iCloud daemon noticed that there was a newer version of the item available, the coordinated read operation blocked until the newer version of the item was downloaded and written to the disk.As of iOS 6 beta 3, when you start a coordinated read operation on a file or package for which you already have a local version, the coordinated read will be granted as soon as possible, and the new version, if any, will download in the background. This call will block for downloading reasons only if you do not have any version of the file available locally. Add CLActivityTypeOtherNavigation for other vehicular navigation—e.g., boats, trains, or planes. Map data will continue to evolve—only a limited amount of high-resolution satellite imagery is currently available. When requesting access to Facebook accounts, the only key required in your options dictionary is ACFacebookAppIdKey. ACFacebookPermissionGroupKey andACFacebookAppVersionKey are now obsolete.If you request a write permission under ACFacebookPermissionsKey—such as publish_stream—you must provide a value for ACFacebookAudienceKey, which can be one ofACFacebookAudienceEveryone, ACFacebookAudienceFriends, or ACFacebookAudienceOnlyMe. In iOS 5.1, the UISplitViewController class adopts the sliding presentation style when presenting the left view (previously seen only in Mail). This style is used when presentation is initiated either by the existing bar button item provided by the delegate methods or by a swipe gesture within the right view. No additional API adoption is required to obtain this behavior, and all existing APIs—including that of the UIPopoverController instance provided by the delegate—will continue to work as before. If the gesture would be insupportable in your app, setting the presentsWithGesture property of your split view controller to NO disables the gesture. However, disabling the gesture is discouraged because its use preserves a consistent user experience across all apps. Autorotation is changing in iOS 6. In iOS 6, the shouldAutorotateToInterfaceOrientation: method of UIViewController is deprecated. In its place, you should use thesupportedInterfaceOrientationsForWindow: and shouldAutorotate methods. More responsibility is moving to the app and the app delegate. Now, iOS containers (such as UINavigationController) do not consult their children to determine whether they should autorotate. By default, an app and a view controller’s supported interface orientations are set to UIInterfaceOrientationMaskAll for the iPad idiom andUIInterfaceOrientationMaskAllButUpsideDown for the iPhone idiom. A view controller’s supported interface orientations can change over time—even an app’s supported interface orientations can change over time. The system asks the top-most full-screen view controller (typically the root view controller) for its supported interface orientations whenever the device rotates or whenever a view controller is presented with the full-screen modal presentation style. Moreover, the supported orientations are retrieved only if this view controller returns YES from its shouldAutorotate method. The system intersects the view controller’s supported orientations with the app’s supported orientations (as determined by the Info.plist file or the app delegate’sapplication:supportedInterfaceOrientationsForWindow: method) to determine whether to rotate. The setStatusBarOrientation:animated: method is not deprecated outright. However, it now works only if the supportedInterfaceOrientations method of the top-most full-screen view controller returns 0. This puts the responsibility of ensuring that the status bar orientation is consistent into the hands of the caller. For compatibility, view controllers that still implement the shouldAutorotateToInterfaceOrientation: method do not get the new autorotation behaviors. (In other words, they do not fall back to using the app, app delegate, or Info.plist file to determine the supported orientations.) Instead, theshouldAutorotateToInterfaceOrientation: method is used to synthesize the information that would be returned by the supportedInterfaceOrientations method. The willRotateToInterfaceOrientation:duration:, willAnimateRotationToInterfaceOrientation:duration:, and didRotateFromInterfaceOrientation: methods are no longer called on any view controller that makes a full-screen presentation over itself—for example, by calling presentViewController:animated:completion:. In iOS 6, the viewWillUnload and viewDidUnload methods of UIViewController are now deprecated. If you were using these methods to release data, use thedidReceiveMemoryWarning method instead. You can also use this method to release references to the view controller’s view if it is not being used. You would need to test that the view is not in a window before doing this. The setContentStretch: method of UIView has been deprecated in this beta release. To achieve the same effect, use the resizableImageWithCapInsets: method of UIImageand display the image with a UIImageView. The bottom edge of a UILabel view is now different from its baseline.Previously, auto layout was interpreting the bottom of a UILabel to be the same as its baseline. While convenient in many cases, it caused problems if you wanted to place the top edge of one label against the bottom edge of another. In such a scenario, the bottom label would overlap the top one, and descenders from the top label could crash into ascenders from the bottom label. Now, auto layout interprets UILayoutAttributeBottom as the bottom of the text box (presuming the label is not bigger than its intrinsic content size) andUILayoutAttributeBaseline as the baseline of the text. If you have already created code for laying out labels according to the bottom or center point, your text will move around a little and you will need to adjust your constraints. The UIScrollView class scrolls its content by changing the origin of its bounds. To make this work with auto layout, the meaning of the top, left, bottom, and right edgeswithin a scroll view now mean the edges of its content view. Create the views you want to put inside the content view and configure their constraints so as to position them within the content view.Alternatively, you can create a view subtree to go in the scroll view, set up your constraints, and call the systemLayoutSizeFittingSize: method (with theUILayoutFittingCompressedSize option) to find the size you want to use for your content view and the contentSize property of the scroll view. Now, the layout engine is integralizing the position variables (x and y) as well as dimension variables (width and height). This means that it will try to satisfy the three constraints with an integer solution, which might not be possible, and thus will log that these constraints are unsatisfiable. In this case, and in all analogous cases, developers just need to remove the redundant constraint (or constraints). In the example above, removing any one of the three constraints will resolve the issue. In iOS 6 beta 4, there is a known bug that when you have a constraint with one item that is a scroll view, the other item is a descendant of that scroll view, and you add the constraint to an ancestor of that scroll view, then the constraint might stop working properly. The workaround is to add such constraints only to the scroll view itself, not to any old ancestor. Note that because the specification is still at the Working Draft state, these methods have the webkit prefix, so they are window.webkitRequestAnimationFrame andwindow.webkitCancelAnimationFrame. The default app cache quota has increased from 5 MB to 25 MB. The JPEG subsampling threshold has increased from 2 MP (megapixels) to 5 MP on all supported hardware except iPhone 3GS and iPod touch (4th generation). Support has been added for <input type=”file”> tags in web forms. Users can upload existing photos and videos from their photo library or take a picture or video using the camera. Previously, this form control was always disabled. In iOS 6 and later, web data (SQL Web Storage and LocalStorage) from a UIWebView object can be stored in a directory that will be backed up. To enable backing up this data, set theWebKitStoreWebDataForBackup key to YES in your app’s user defaults. This should be done only if your app relies on web content data that cannot be reloaded. If yourUIWebView object opens links to arbitrary web content, this key should be set to NO. Toggling the value of this key will not preserve existing web view data. Did you get all of that? 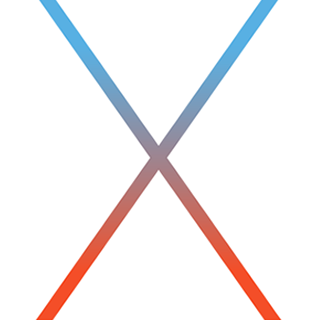 We’ll be keeping our eyes peeled for any significant new features or changes in iOS 6 beta 4, and we’ll let you know as soon as we find something. Until then, be sure to let us know if you find anything in the update down the comments section.